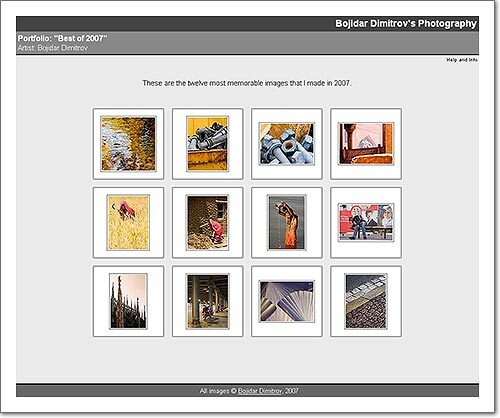 Ten days ago I gave myself an assignment: build an online-portfolio with the 12 best images that I took in 2007. The first version of the portfolio is now online, and let me tell you, it was not an easy assignment! I had to decide which images to show, how to show them, and build a functional web galley. I stared with about 40 images, a very simple HTML page and two Photoshop actions, one for producing a thumbnail and one for making the larger image. What followed were no less than 50 iterations of moving the better images towards the beginning, deleting the last image, improving the look of the web page, and refining the action that produces the thumbnails. When I was down to about 20 images, the HTML was already looking good, so I started experimenting with CSS and Slimbox. I’ve now chosen the “winner” 12 images, finalized the appearance of the web page and I think I’ve got all the technology playing together. The result can be seen here and I’ll be very thankful for feedback.